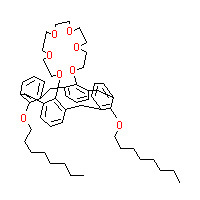 1,3 dioctyloxy calix 4 arene crown 6 is a calixarene with aliphatic ether alcohol function group appended to the lower rim and a crown cap forming a crown ether. This calix crown ether could be potentially used in nuclear waste management. 1,3 dioctyloxy calix 4 arene crown 6 is manufactured in india, before supplies are made to our valued customers, a strict inspection and analysis is carried out by us and also from reputed International Laboratories, as counter check. Appearance White colour crystalline powder.